The following group types are not accepted by this hostel: Junior / Primary School, Business Trip, Stag/Hen/Bachelor Party, Cultural Group If you have misrepresented the type of group you are booking for, your booking may be cancelled by the hostel." 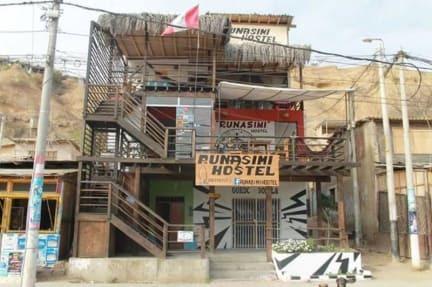 Runasimi Hostel Mancora is much more than a simple conventional hostel. In Runasimi Hostel we have created a multicultural space with many alternatives for the person who stays in our 'house'. We offer from the best hotel service with laundry, TV, breakfast, Internet, good music and reading spaces, such as surfing lessons and tours WiFi the use of kitchen and grill, the cost includes a complimentary continental breakfast is served in every morning, we have rooftop for the use of guests. We provide activities to do, surfing lessons, kite surfing lesson, whale watching, fishing, diving, adventure sports, hot springs, surfing tour. It is located in the in front of the Pan-American Malecon, you can reach in mototaxi or walking, as we are close to various shops, offers group rooms, matrimonial, restaurant and bars. We are in one of the most privileged locations of Mancora and Mancora Lighthouse, near to some of the most renowned and popular attractions and landmarks of the city such as Parque Nuevo de Mancora amongst other interesting places of our area. 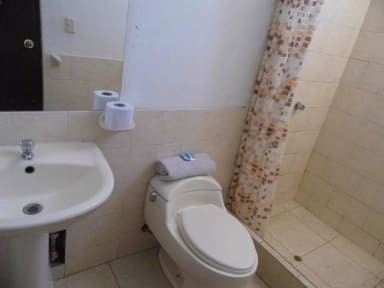 We have shared dormitories of 4 beds with private bathroom, shared dormitories of 6 with private bathroom, shared dormitories of 3 beds with shared bathroom, matrimonial with double bed plus a bed of square and a half with private bathroom cable TV, matrimonial with double bed with TV -cable private bathroom, double with shared bathroom. Check in from 07:00 to 23:00.